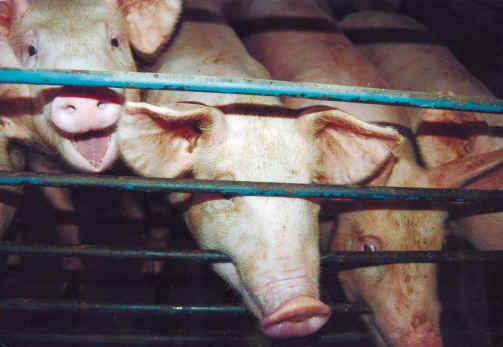 (Pig Exploitation - Factory Farming - 09) Take a really good look at the utter despair of the two pigs who are biting the metal bar, and the plea for mercy on the face of the other pig. Look into their faces and eyes and "see" their souls. They're no different from those of our companion cats and dogs. And, if we wouldn't consider eating our companion cats and dogs, we shouldn't eat them either.